One of the joys of living in a northern climate is the changing seasons. I love it when fall comes around and I can “turn my closet” and pull out my heavy turtlenecks, boots, and tweed jackets after a summer of strappy sandals and white jeans. And spring brings the same joy. Supposedly. When it finally gets here, for more than twenty-four hours. But in the meantime, early spring dressing can be complicated. Because it almost takes a mathematical formula to decide what to wear. Take for example one day a week or so ago when I wrote this post on my spring shopping wish list. That was a beautiful day. I had finished my spring research and was finalizing my list. Right down to deciding what I would wear when my planned shopping day rolled around the next week. 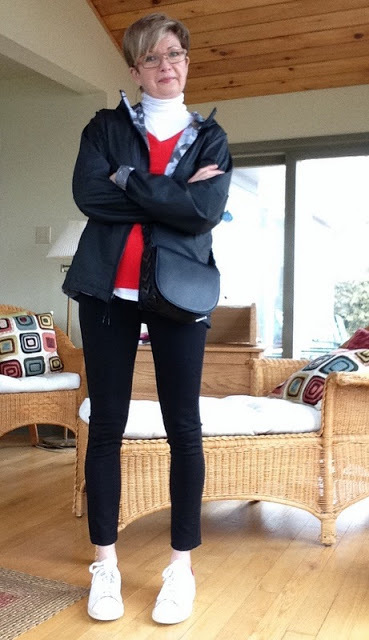 Except, I never did get to wear my Theory spring anorak, with my black turtleneck, new Vince knit pants and my loafers. Because the day I should have been shopping, I was curled up with a book instead, watching the snow, and rain, and freezing rain blow sideways past our sun room windows. Retirement means I can usually jettison my plans if the weather is uncooperative. So I had a very quiet day, a sweat pant and no make-up day. In fact, the most exciting thing all day was watching the enormous flocks of geese trying to land on the river in the gale force gusts of wind. Phew. It was a pretty hairy day to be a Canada goose. So when I had a physiotherapy appointment one sunny day, a few days later, and had to run errands after, I decided to finally venture out in my Theory jacket. I swapped out the black Vince turtleneck for my white one, and traded the loafers for my Stan Smith Adidas. Comfy, casual, easy to change for my physio appointment. Perfect. But. Even though the day was sunny and gorgeous, it looked too cool for the light jacket and the Vince, silky turtleneck. So I added an orange V-neck sweater for warmth. Yep. A great spring run around outfit. Until I stuck my head out the door. Ah… nope… brrrr. Turned out it was way too cool for bare ankles. And even for the two light sweaters. Better but still chilly for a day with a wind chill. So, in order to decide what to wear, I had to do “some ciphering,” as Jed Clampett used to say on the Beverly Hillbillies. Remember that show from the sixties? When I was a kid Mum used to say that our family life on the farm sometimes resembled that of the Clampetts…. sheep in the car, pigs in the driveway… but that’s a tale for another post. Anyhoo, it was too cold that day for bare ankles, and a light sweater (or even two.) Too springy for my winter coat. Not cold enough for gloves or, heaven forbid, a scarf and toque. I subtracted the Vince T-neck, the orange Gap sweater, and the sneakers, added my camel turtleneck from Aritzia, and my Paul Green boots. And socks. Finally. I was warm, and I still felt springy. 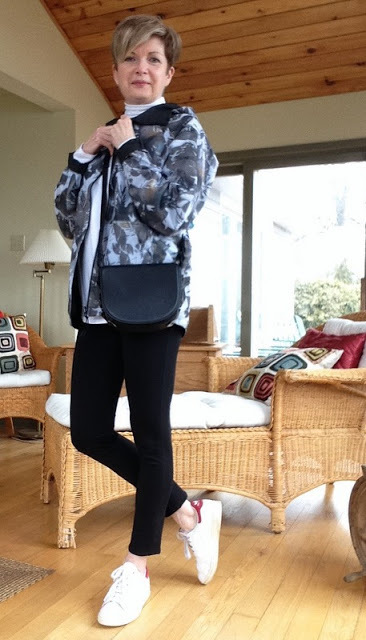 When I showed up for my physio appointment, Erin the receptionist and I chatted about how hard it was to dress for spring days like this: sunny + cool + a stiff wind. Erin said people had been arriving at the clinic in every possible combination of winter and spring outfits. I said if you wanted to wear a light jacket, you had to add a heavy sweater + socks. “Fashion math is hard,” Erin said. And we both laughed. “That’s brilliant,” I replied. “Can I steal that line?” She said I could. Which brings me to today, when I’ve got things to do and places to be. 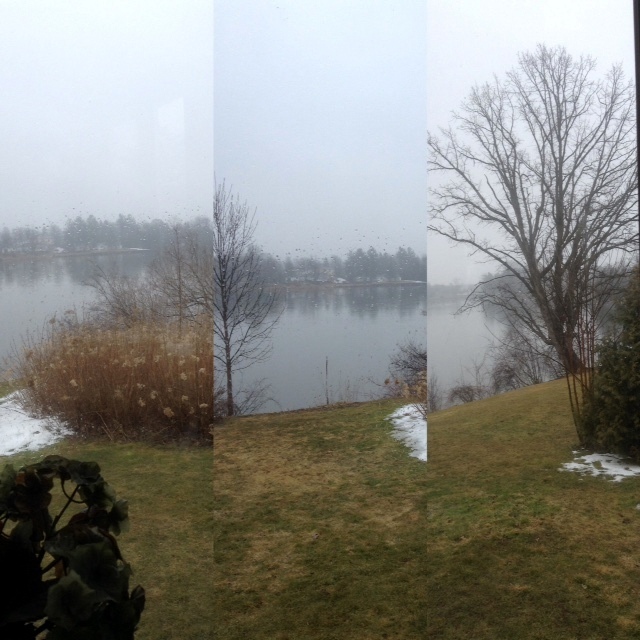 From every angle, it was a miserable early spring day. Although it was glorious yesterday, today dawned damp and cold. My physio appointment outfit above would have worked fine. Except now it was raining. So, let’s do the math. 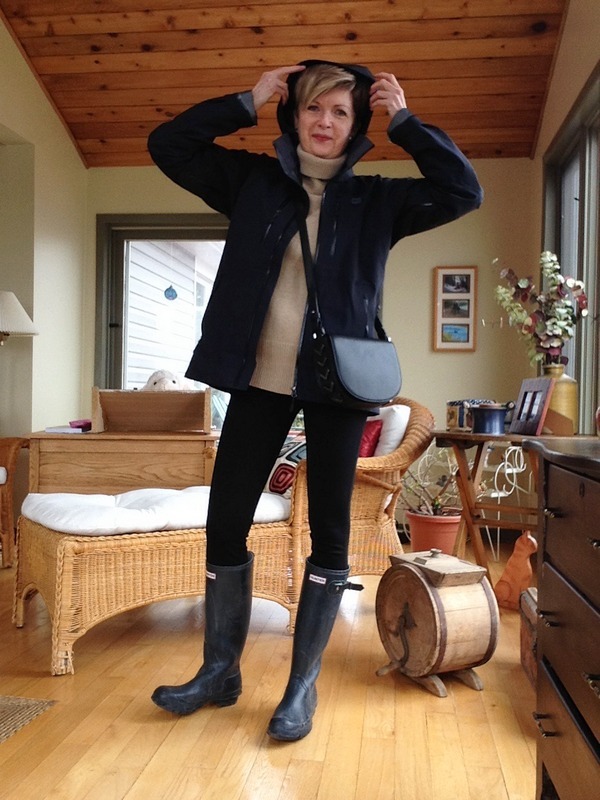 Miserable, cool + rainy day + black Vince knit pants – minus my good Paul Green boots that I don’t want to ruin, similarly – minus the light Theory jacket, which while “water resistant” isn’t waterproof. I’ll + my Hunter rubber boots, and + my waterproof Gortex jacket. Now, finally = warm + dry. Did you get all that? See? Fashion math isn’t hard at all. 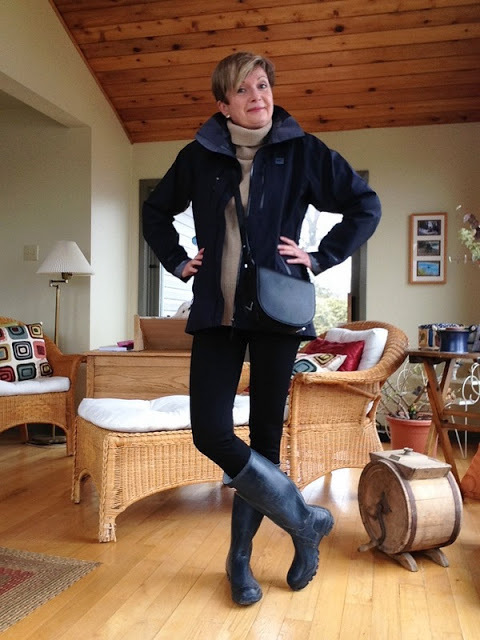 You know, I think it’s kind of a hoot that I’m getting so much city wear out of my Hunter boots and my Gortex jacket this year. Especially since I bought them for canoeing and fishing. Yesterday I wore them for our afternoon tramp across the fields near our house. I even sloshed through a few mud puddles. Of course I had subtracted the Mackage bag, and substituted an old tee shirt for my good camel sweater. I might wear some of my country clothes to town but, like my mum taught all us kids, I never wear my good clothes out to play. I’ve rescheduled last week’s aborted spring shopping day to later this week. I hope the weather is kind and let’s me go back to my original equation. Spring shopping success = planning and preparation + a wish list + a comfy, smart, springy outfit. 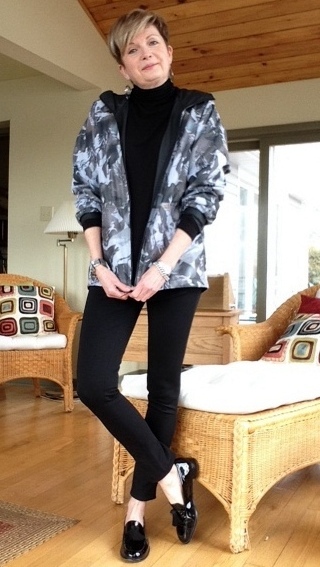 With bare ankles and my Theory spring jacket. Here’s hoping that this all adds up. I always was pretty good at math… but I’m a bit rusty, I’ll admit. So, fingers are crossed. How do you handle the complications of early spring outfit planning? Do you need fashion math to get dressed? I've had days like this recently. So much so I've taken to opening the door to assess temperatures and then checking the forecast before getting dressed and venturing out.Even on sunny days I haven't exposed my ankles though. I'm still loving my boots …although the fur lined ones have been a bit too warm recently! As well as a small cross body bag I've started wearing a Longchamp backpack containing umbrella wooly hat and sunglasses …soon I ll add sunscreen! Also handy to pop a lightweight sweater in ..and I'm organised whatever the weather throws at me! Hope the physios helping your back problem. Really looking forward to the sheep in the car, pigs in the driveway post! Me too, re the last and first sentences of Rosie's comment above. Early spring outfit planning is not complicated for me, since I never feel cold in Portland at this time of year. I simply decide whether to add a raincoat or umbrella to my basic outfit and whether to wear footwear for rain or not. Oooh, thanks Rosie. And Leslie. A perfect mark, just like in grade ten Math. Now, wearing a backpack takes all the ciphering out of the equation. You're prepared for everything. My back is much better, thanks. Just needed a final tune-up before we leave for a long, long drive later in the week. Wish I could say the same, Leslie… about not being cold, I mean. Today we had a wind chill temp of -6 and it felt way colder than a winter -6 temp. Not sure why. Dampness? Unrealistic expectations…as in wanting spring warmth to be here? Who knows. Thanks, Sue. Hah…'calculated'… there's a math term I didn't think to use. Ha! Weather Trifecta! Fashion Math! You are on a roll today! Fun post. I am with you all the way on this one. Each day sets us a different 'mathematical' problem. I have changed several times some days in order to get out the house! Oh, me too. I hate getting where I'm going and being too cold or too hot. I'm just glad that I don't have to do this before work every morning. Fashion math! And I love the way your wear your rural gear in the city. Looks great, and authentic. I'm so pleased with my new-ish Gortex jacket. It is warm and waterproof and still looks pretty good. And I laugh every time I wear those Hunter boots into town. Still feels wrong, somehow. Love that Theory jacket, Susan. It takes casual to a new level! I suffered through Math in high school, so you can imagine how many years I've worked at finding the answer to weather dressing after moving to Vermont almost a decade ago. A closet of coats, boots and layers that could use some subtraction! Getting ready for the day at 1400' elevation means peeling off jackets, scarves, etc. by the time I get to the village. I feel like those Russian dolls that are stacked inside of each other – hoping the final version looks as good a the first. Thank you for your inspiration – I can certainly relate! I can imagine that higher elevation dressing is very complicated! Love the image of the Russian dolls! Love this view of how your part of the world lives! Whatever the fashion math, it all adds up to a "Great Look" on you! Stay warm and flexible (going-out-outfit and your back). Thanks, Charlene. Flexibility is easier with outfits than with backs… but I'm working on it. All very true and spring seems to require advanced level maths and autumn more junior level for some reason. Yes… good point. Autumn is definitely more junior maths. I've always found it interesting that we say 'Math' and you guys say 'Maths.' Wonder how that differentiation ever developed. What a fun post and so true for us in Ontario. I'm sitting watching the puddles get bigger on my path to the garage, and re-assessing what to wear to go grocery shopping. And now we're supposed to get snow Sunday and Monday! March going out like a lion? Thanks, Yvonne. Ackkk… March IS going out like a lion. And April is coming in the same way, if we can believe the forecast. Loving ALL your outfits! When we lived up North I would be gone for long days into New York: car to train to subway kind of thing. And the in between seasons were killers! You just do not want to be lugging around heavy coat, nor do you want to freeze waiting for the bus. And, in the "old" days I would carry at least one enormous portfolio with me (ah, thank goodness for iPads and laptops!). Glad those days are over…but down here it's more a matter of it going from hot to hotter! Oh, I hear you… back in the day, taking several buses to work and having to lug all my teaching supplies and various levels of warm clothing! Very glad those days are over, too. Hee, I love your sense of humor. The math looks fine to this English teacher anyway. 😉 Love that cool jacket … is it reversible?! Adding to the spring fashion math, is the fact that my office building can't decide whether to turn the heat on or off. So I've taken to dressing in layers to be inside, ugh! On Friday my assistant asked me if I wanted a portable heater in my office. On April 1st. And she wasn't kidding. I worked in a school like that once Heather. One of my classrooms was 34 degrees (computer lab with minimal ventilation) and to sit in my office I neede a heavy sweater and sometimes gloves. Indoors fashion math! Cold ankles are the worst. Good thing about retirement is when the weather is really bad… one can choose to not to get dressed at all. I recently read an article from a fashion blogger that got it right! We all seem to pick an outfit around the pants/skirt or a top we want to wear; she said pick your shoes first!! That makes sense in this kind of weather. Can't wear that skirt with those peep toe wedges! That is a good idea isn't it? Was the Sue-Une Femme's blog by any chance? Susan, I love this post. So many fellow fashionistas are feeling the exact same way about the changing season. I have chosen this post as one of my featured favs from last week's Thursday Favorite Things Blog Hop! I will be featuring you on my blog on Thursday. Thanks so much Shellie. Much appreciated! Thin/lightweight turtlenecks layered under a heavier sweater or jacket is how I usually go. I do have a couple of thicker t'necks that go well over jeans and not requiring anything more. Hi Susan, It's me again and you're still just as cute as ever! 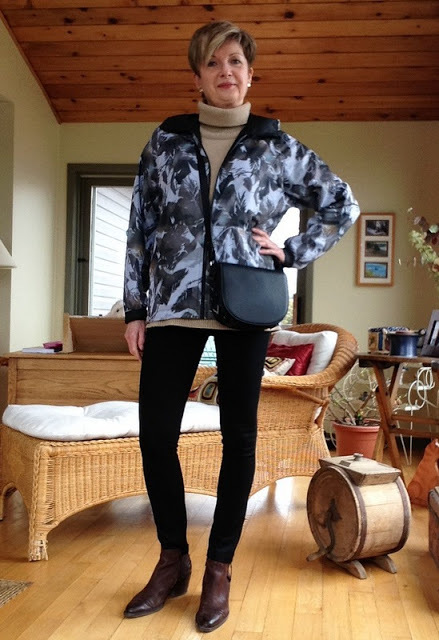 Thanks for adding your fashion flair to the My Refined Style Linkup. Thanks for hosting the link-up, Shellie!